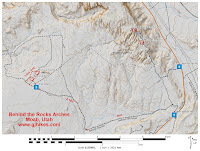 The Picture Frame and Balcony arches are located in the Behind the Rocks area near Moab, Utah. The arches are situated near opposite corners of a large dome of sandstone that forms a ridge on a small mesa that overlooks part of the Behind the Rocks area. To get to the trailhead drive south out of Moab for about 13 miles and turn right at the sign in this photo. The turnoff is near the crest of the hill on the highway. Continue driving for 5 miles to the fork in this photo. Just past the quarter mile point from the highway turn left where there is a sign for Picture Frame Arch. 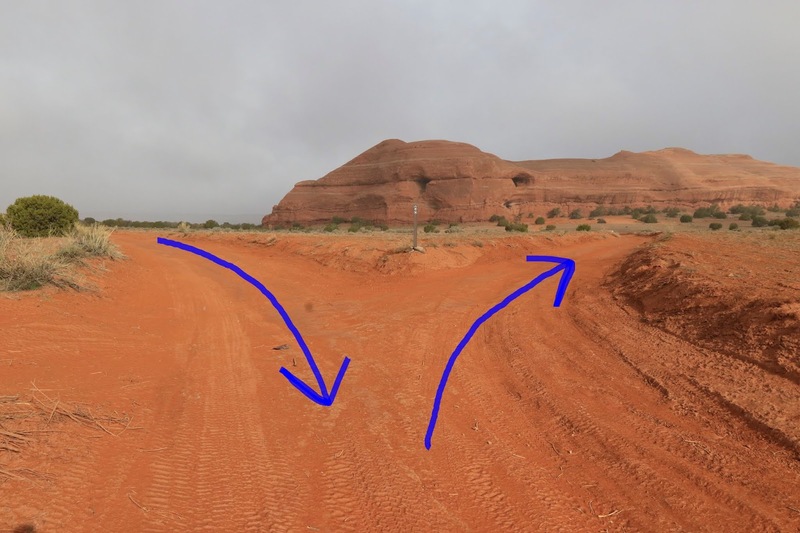 Near the 3 mile point the road bends to the right as it crosses a wash where there is some uneven slickrock that requires a high clearance vehicle or very careful driving. Take the left fork near the 4 mile point for the final mile. There are a handful of other jeep roads that turnoff the main route all along the way that might make route finding a little confusing. The road really is a high clearance 4x4 route even though we have seen passenger cars get quite a way into the area and medium clearance 2-wheel drive vehicles that made it all the way. They might be taking a better route that we don't know about. We looped around the area in the counterclockwise direction when we took the photos for this post. No sooner do you get headed toward the rock that another route cuts across the road and just before you reach the rock there is yet another one. The road heads straight to Balcony Arch. It is high up on the cliff in an inaccessible spot but it is still a nice looking arch from down below. After Balcony Arch the road turns and parallels the rock. There are a couple of side trails that lead over to some nice looking primitive campsites that are nestled up to the side of the cliffs. Remember to only camp in existing sites and not create any new ones. At the end of the rock the road passes through a gap and loops around to the backside of the rock. From this point on the trail gets a lot rougher. Picture Frame Arch comes into view as the trail starts out along the north side of the rock. There is a short side trail that leads up to the cliff below the arch. A person with good traction could make their way up the slickrock on the right side of the arch and take a picture looking through the arch of the Behind the Rocks area. For the rest of the way around the loop the trail encounters a couple of patches of uneven slickrock. Jeeps and ATVs will have little or not trouble with any of it and if you are hiking or mountain biking it won't matter much. As the trail wraps around the west end all of those other roads come back into play. It is one of those 'all roads lead to Rome' things as long as you are going to the left. The first road to the left stays closer to the cliffs. The second road to the left is wider and the third road is the main route. There was a little rain the night before that was just the right amount to settle the dust. It snowed for a few minutes while we were hiking and the clouds settled in low over the cliffs. On the drive out the sun came out and it eventually warmed up into the 60's. For those that don't want to risk driving into Picture Frame Arch a mountain bike would be an excellent option. 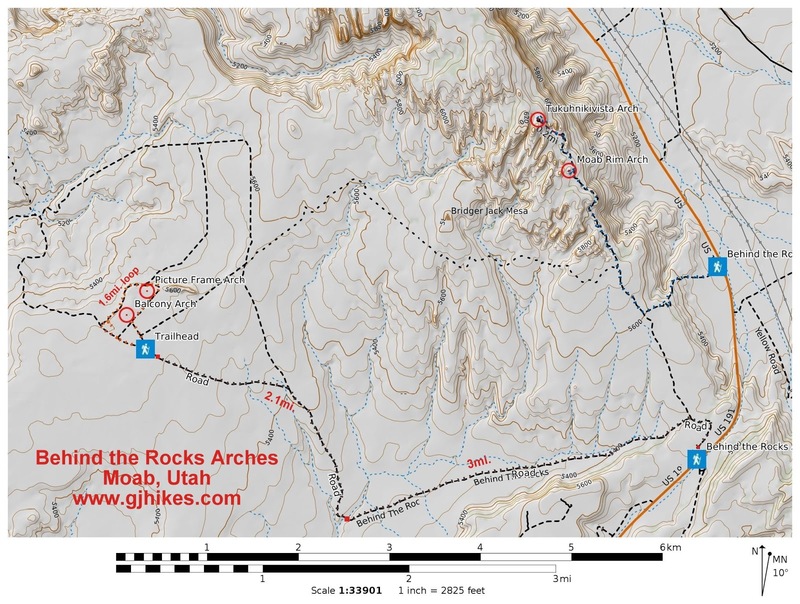 Some of the route is part of the annual '24 Hours of Moab' mountain bike event. Picture Frame and Balcony Arches are a nice off the beaten path place to visit around Moab for those looking for something different to do. If you would like to see it for yourself then all you have to do is 'Take a hike'.